The South Street Cemetery is Fitchburg’s oldest and its only colonial-era burying ground. It is located on the south bank of the Nashua River at the corner of South and Walnut Streets and was established in the 1760s on land given to the town by Deacon Amos Kimball, who is buried here. 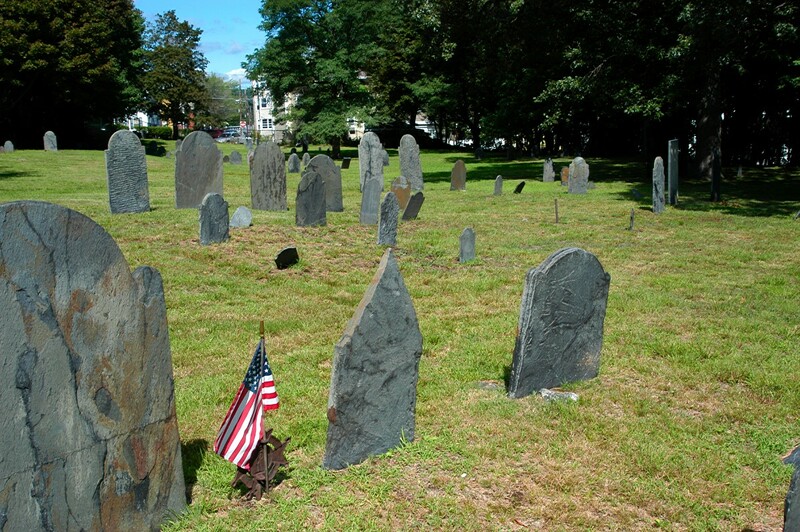 The occupants of the South Street Cemetery were the first colonial settlers of Fitchburg: they cleared the land, established the first farms and shops, formed the town government in 1764, and laid out the original streets. Many of them served as soldiers in the American Revolution and answered the call to march to Concord on the 19th of April in 1775. Family names represented in the cemetery include Adams, Allen, Boutell (Boutelle), Boynton, Bridge, Brown, Carter, Cowden (Cowdin), Durant, Eaton, Flag (Flagg), Fox, Fullam, Fullar (Fuller), Garfield, Gibson, Goodrich (Goodridge), Hale, Harris, Hodgskins, Jaquish (Jaquith), Kimball, Lincoln, Low, Maccarty, Ordway, Osburn (Ozborn), Parker, Payson, Perry, Pierce, Polly, Sampson (Samson), Sawyer, Scot (Scott), Smith, Snow, Stearns, Steward (Stewart), Stickney, Storey (Story), Thurlo (Thurlow), Thurston, Upton, Wheeler, and Wood. 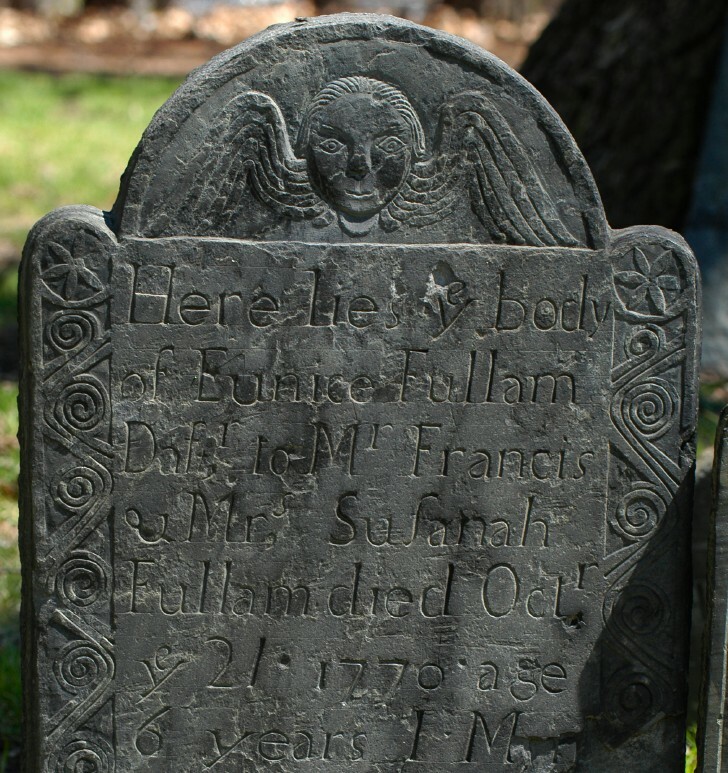 The gravestones of early New England, unlike modern machine-made gravestones, were all carved by hand, one at a time, by talented craftsmen. Our early burying grounds are outdoor museums of their work. 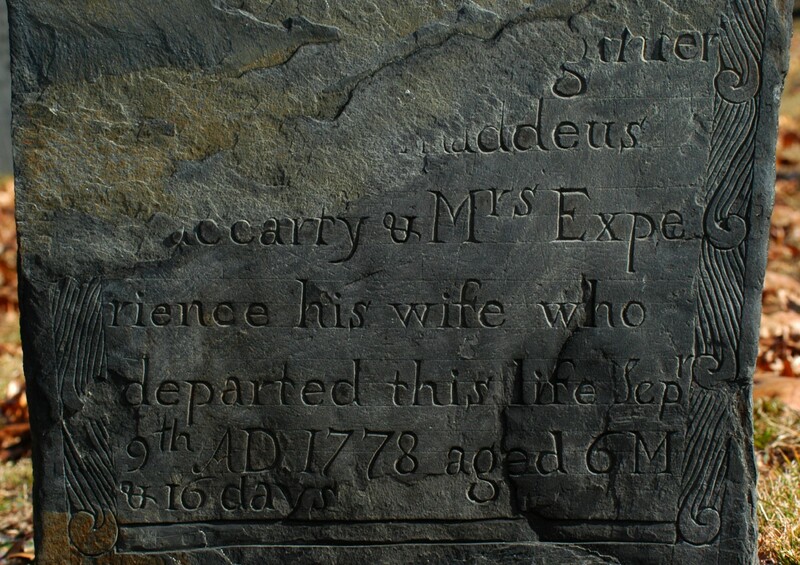 Researchers have identified quite a few early Massachusetts gravestone carvers, and the South Street Cemetery includes fine examples of stones that were made in the workshops of William Park of Groton (1705–1788), Moses Worster of Harvard (b. 1739), William Young of Worcester (ca. 1711–1794), and John Dwight of Shirley (ca. 1740–1816). With a little practice you can learn to recognize their distinctive styles. These photographs of the South Street Cemetery are all © R.J. O’Hara and may not be reproduced elsewhere without permission. Other municipally-owned cemeteries in Fitchburg include the Dean Hill Cemetery (1791), the Laurel Hill Cemetery (1800), the tiny West Street Cemetery (1798) and Hartwell Cemetery (mid-1800s), and the Forest Hill Cemetery (1856). Fig. 1. Fitchburg’s South Street Cemetery as seen from the west (South Street) entrance. The earliest stone in the cemetery dates to 1766, and the last burial was in 1851. All of the original stones are slate except for one marker of white marble (see below). A number of modern rectangular stones have been set into the grounds over the years to replace earlier headstones that were lost or destroyed. Fig. 2. The South Street Cemetery as seen from its eastern border (looking in the opposite direction from the previous photograph). 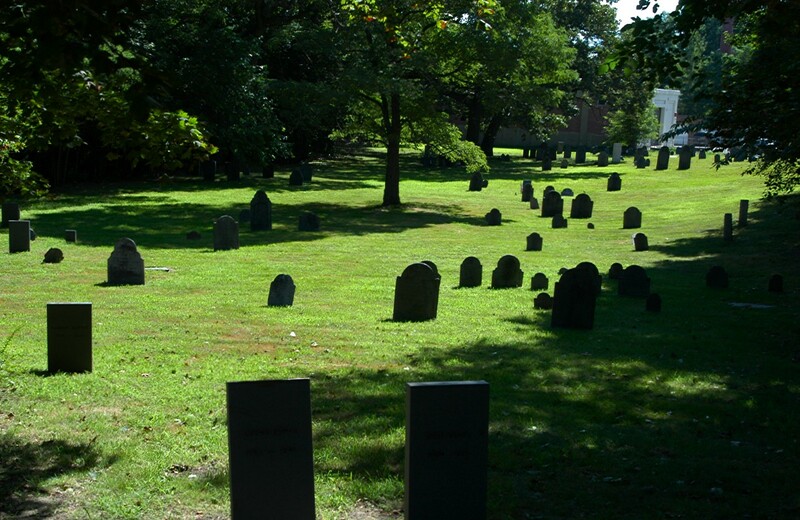 As with most colonial cemeteries in New England, all the headstones face west. It is a sign of South Street’s relatively good state of preservation that a large proportion of the matching footstones are also still in place. Fig. 3. 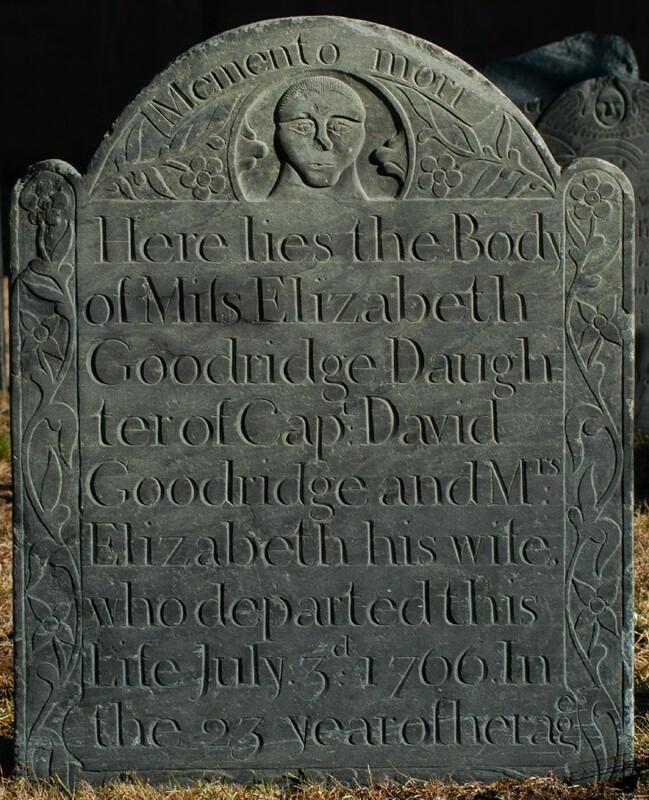 This 1766 marker for Elizabeth Goodridge is the oldest stone in the South Street Cemetery and the oldest in the city of Fitchburg. It is the work of William Park of Groton (1705–1788), one of the most prolific stonecarvers of eastern and central Massachusetts during the second half of the eighteenth century. The shape of the head is distinctive for this period of Park’s work, and the five-part flower that appears at several places in the design is also characteristic. Fig. 4. The 1770 Eunice Fullam stone is the only marker in the South Street Cemetery that can be attributed to Moses Worster of Harvard (b. 1739), son of Jonathan Worster, the carver of the famous ghost-like geometric heads found in many mid-century burying grounds in east-central Massachusetts. This stone’s later design features a more conventional winged head in the tympanum. Unlike the carvers of the Park workshop, Jonathan and Moses Worster were clearly not writing-masters, and their lettering is much more irregular in character. Fig. 5. 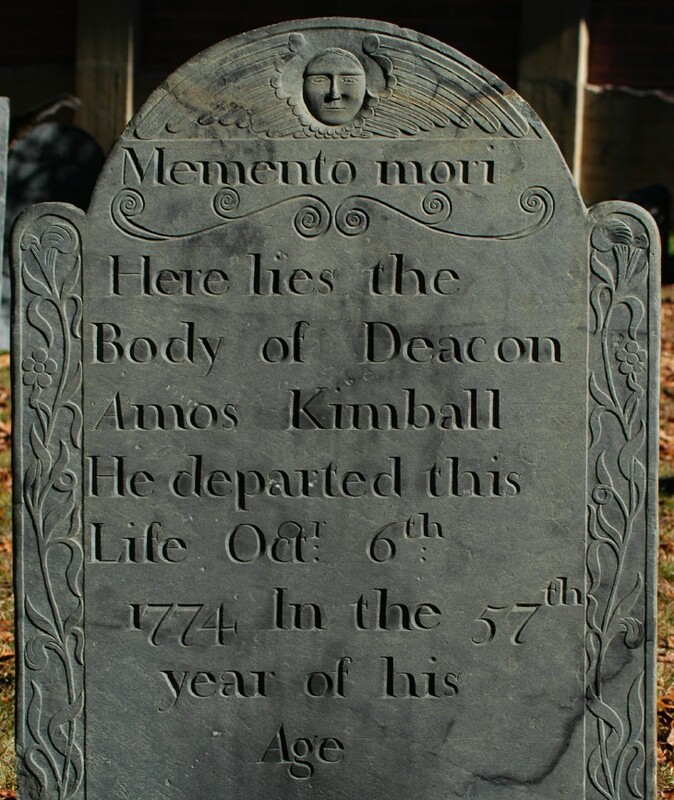 This large, deeply cut 1774 stone of Deacon Amos Kimball is the work of William Park’s Groton workshop, and it is probably from the hand of one of William’s sons, John (1731–1793) or Thomas (1745–1806). The characteristic five-part flower is visible on both side panels. Fig. 6. This 1778 marker of little Elizabeth Maccarty is the only stone in the cemetery made by William Young of Worcester (ca. 1711–1795), the “Thistle-Carver of Tatnuck” as Harriette Forbes has called him. It is made from the rusty, low-grade Worcester phyllite that Young commonly used, and its upper portions have completely delaminated. Fig. 7. 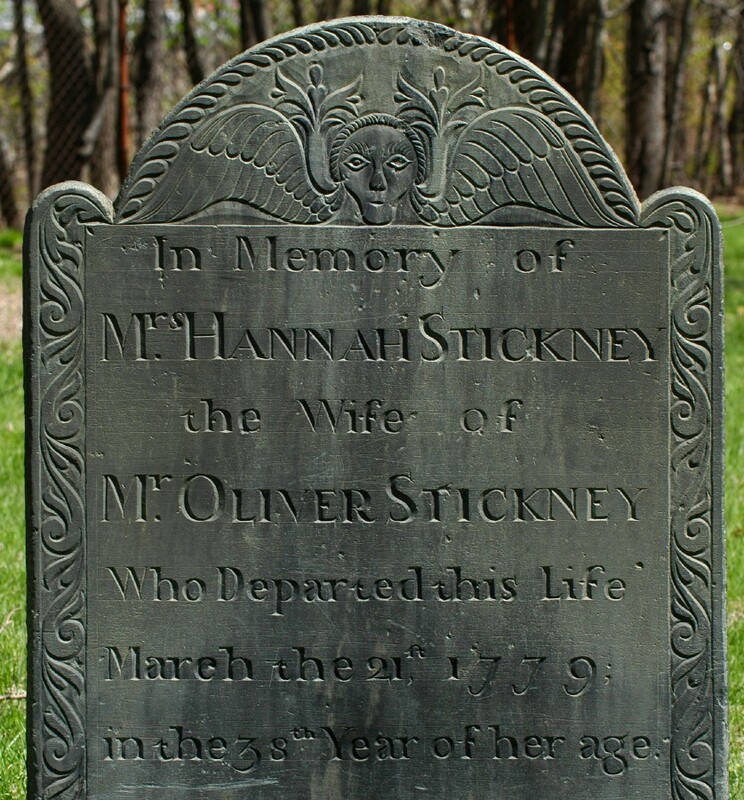 This handsome 1779 stone of Hannah Stickney is an excellent example of the early work of John Dwight of Shirley (ca. 1740–1816). Distinctive features include the narrow-chinned face with “Dwight sprouts” on either side, the small lowercase t, the tiny gouges in the upper corners of the tablet, and the characteristic row of “Dwight drops” along the upper margin of the tympanum. Fig. 8. 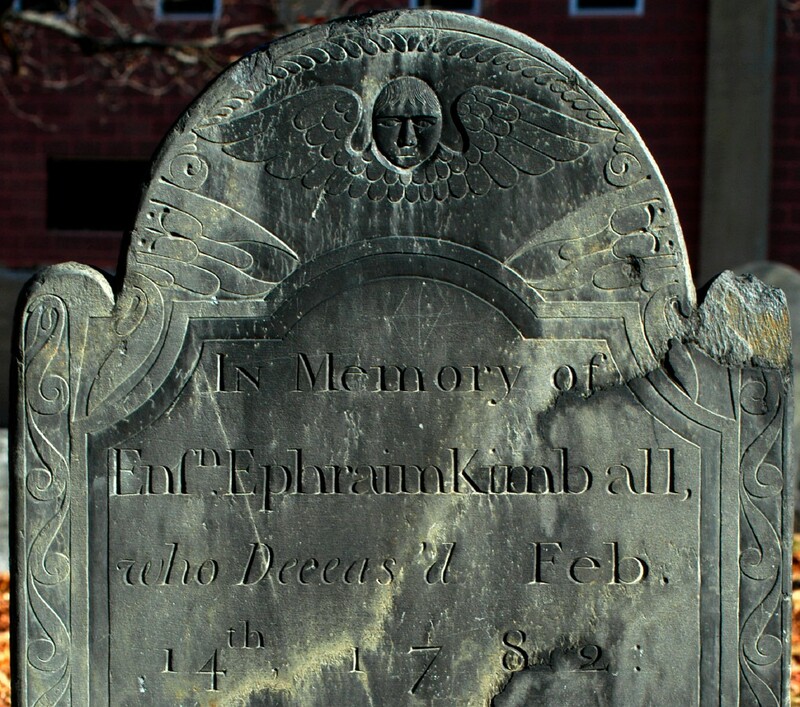 The 1782 stone of Ensign Ephraim Kimball is an example of the later “floating-head style” of John Dwight of Shirley, with the characteristic row of “Dwight drops” along the upper margin of the tympanum. Fig. 9. 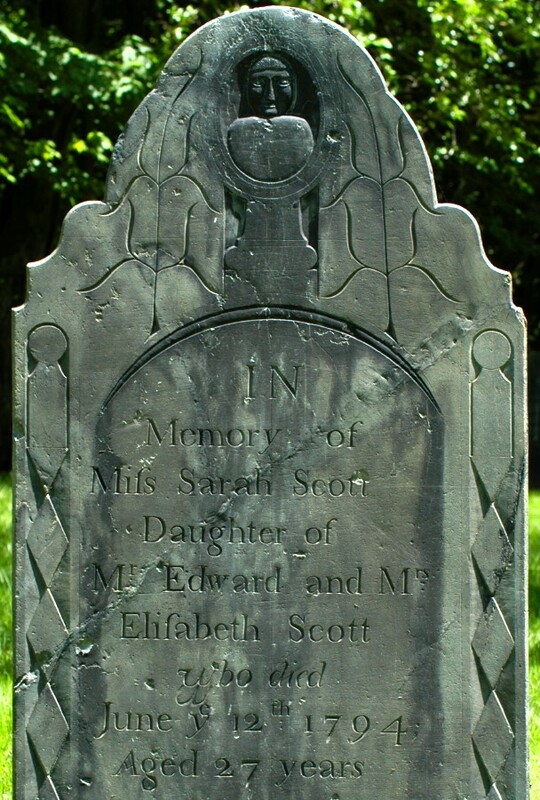 This 1794 stone of Sarah Scott was made by a carver whose work is well represented in the South Street Cemetery, but who has not yet been identified. I call him “the Crescent Carver” and conjecture that he was an apprentice in the Park workshop during the 1790s; he has a stylistic relationship to “the Chesterfield Carver” who was also working about the same time. The Crescent Carver produced both willow-and-urn and face-style tympanums, and almost always worked on stones with scroll shoulders. His side panels often have simple lozenge patterns with ball-shaped finials; the tablet commonly has a crescentic upper margin; the lowercase a typically has a large swollen hook; the capital A usually has a v-shaped crossbar; the 7 has a swollen stem; and the “reclining 9” appears to lean comfortably backwards. This carver is also noteworthy for his inability to center his lines: nearly every stone from his hand seems to have at least one line that is off-center. And he frequently makes errors: almost all his stones have a major lettering mistake that was ground down and carved over, like the misaligned italic w on this stone. Fig. 10. 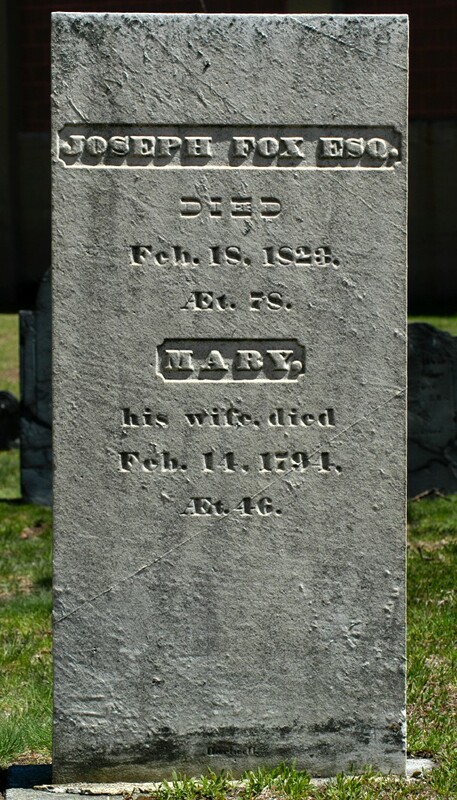 The 1823 marker of Joseph Fox, Esq., and his wife Mary Fox is the only marble stone in the South Street Cemetery. It is inscribed with the name of its maker, “Hartwell,” in small letters at the base. This is probably the carver I. Hartwell of Ashby, whose identity has not yet been investigated. He may have been a forerunner of the stonecarving firm of Hartwell & Reed that was located at 279 Main Street in Fitchburg in the late 1800s.